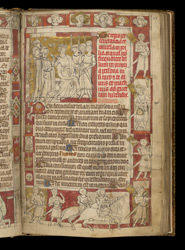 War, an important subject for a king, has a large section devoted to it. Figures of kings and nobility were to decorate the section, but they remain unfinished, raising doubt that Milemete's two manuscripts were ever given to the king. Nevertheless, this page provides an opportunity to see working procedures. It has been laid out, decoration sketched, text written, gilding applied, and ink applied over the sketch. Work stopped during the last stage, application of colour. In the right border, instructions for the painter are visible on one of the figures.